Mizuno have developed netball shoes to endure the toughest of circumstances and situations athletes may get themselves into on the netball court. They have been manufactured to provide Netball players the worldover with a light yet stable shoe providing a superior feel. The physical demands in netball vary from position to position and with this in mind, Mizuno have constructed a range of Netball Trainers to suit a wide variety of playing ablities, ages and styles. When it comes to netball, the two main characteristics in Netball are speed and stability. Ensuring you are quick off the mark whilst being stable enough to stop and receive the ball. Dependant on the playing style of the athlete, they may need a shoe that withstands instant changes of direction as well as dynamic movement whereas other players in different positions may need a shoe with maximum stability and cushioning to withstand powerful, explosive movements. 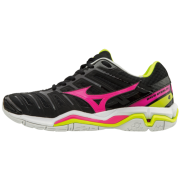 Mizuno Netball trainers have been rigorously tested and retested with countless materials being used to find the perfect shoe enabling you to perform at your best on the court. When wearing a pair of Mizuno Netball Trainers, you can have full confidence that a wide variety of professionals from different backgrounds have come together in constructing a shoe suitable for the demands of Netball athletes. As the official footwear partner for the England Netball team, Mizuno have proven that they are a world-class brand. The team plan on working closely with Mizuno to further develop their footwear ranges and ensure that the footwear is practica. Their partnership with the England Netball team will take them up to the Netball World Cup in 2019 which will see stars such as Sara Bayman, Eboni Beckford-Chambers and Jade Clarke perform on the highest of stages wearing Mizuno Netball Trainers.